We all grew up thinking that drinking our orange juice was healthy, but unfortunately fruit juice and especially grocery store juices are not healthy for us at all. Fruit juices are loaded with sugar that is readily metabolized into fat. This includes both packaged fruit juices and fresh fruit juices. Yes, it is healthy to eat fresh fruit, but any time you are consuming fruit juice, you are eating spoonfuls of fructose sugars that raise your insulin, slows your metabolism, contributes to chronic diseases, and make you fat. In other words, even natural sugars = bad. 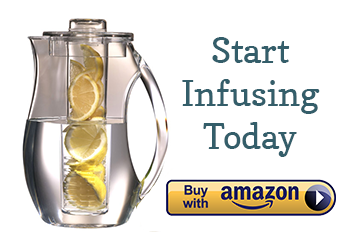 Enter infused waters. By putting pieces of fruit into purified water, you get the flavor of your favorite fruit, but without the sugars and calories. Including fruit rinds in your water recipes adds even more fruit flavor. Fruit infused waters are not going to be as nutritionally dense as a piece of fruit or as freshly squeezed juice, but many nutrients do leak out of the fruit into the water, especially if soaked overnight. 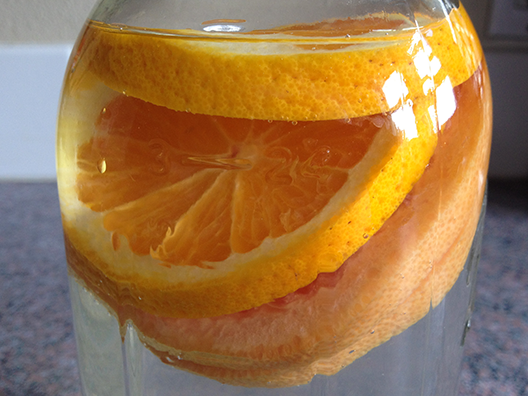 If you love your daily OJ and are having trouble making the switch, try Orange & Lemon Infused Water. It’s quite sweet and citrusy….and practically calorie-free.